Paddy Power. It’s hard to say the name without smirking a little and shaking your head. They are the naughty kid in class that is secretly one of the teacher’s favourites, always up to something and always looking for fun – even their name could be considered offensive these days. The bookie has had their wrist slapped more than a few times in the past for taking a joke too far, and even for breaking their own terms, but punters continue to love them for their sense of humour and their regular enhanced prices. Although they are an Irish bookie this does nothing to limit their offerings elsewhere, and in fact, they boast more UK and European markets in some categories than many UK based sportsbooks. 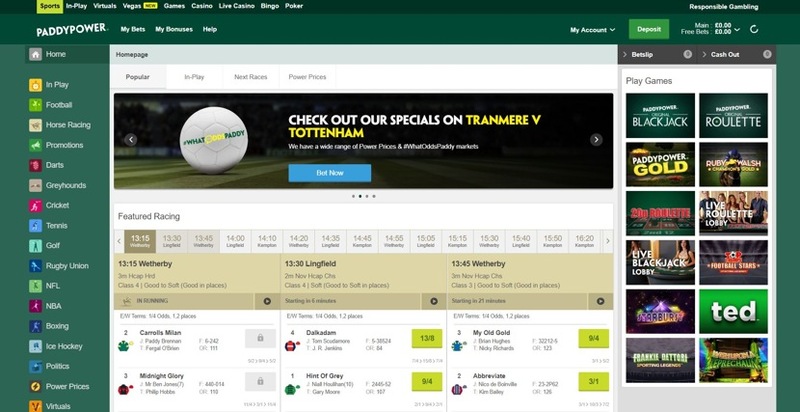 Paddy Power have carved out a niche for themselves by offering more specials and novelty bets than other bookies provide, and this ties in with their branding perfectly – some of them are so inventive they don’t exist anywhere else at all. There are three categories; Specials (TV and celeb stuff), Current Affairs (Business, Pope etc), and Politics (Worldwide). Being an Irish bookie, their coverage of Gaelic Football and Hurling is also particularly good, as close to full market coverage as you can get and even deserving of their own coupons and specials as well as live coverage. Football, Horse Racing, Cricket, Darts, and Tennis all get a lot of attention, but overall there are usually between 35 and 40 different categories on the list offering plenty of lines and bet types. There are other books with greater depth, but not many and not by a lot. Plus, Paddy Power accept requests from punters so if you don’t see something you are after just ask using #whatoddspaddy on Twitter. When it comes to the odds there isn’t exactly anything to worry about, but there’s not much to get excited about either. They are generally just ok, very rarely the best, but there are plenty of opportunities to increase value with the shed load of enhanced odds (or Power Prices), offers, and specials. Of course, best odds are available at the races so you will be alright in that department. If in play betting is an important part of your day to day gambling activity then Paddy Power may not be for you. What they have come up with works as a product, but in terms of impressive extra features, statistics, or any sort of style it is severely limited – it looks rubbish. 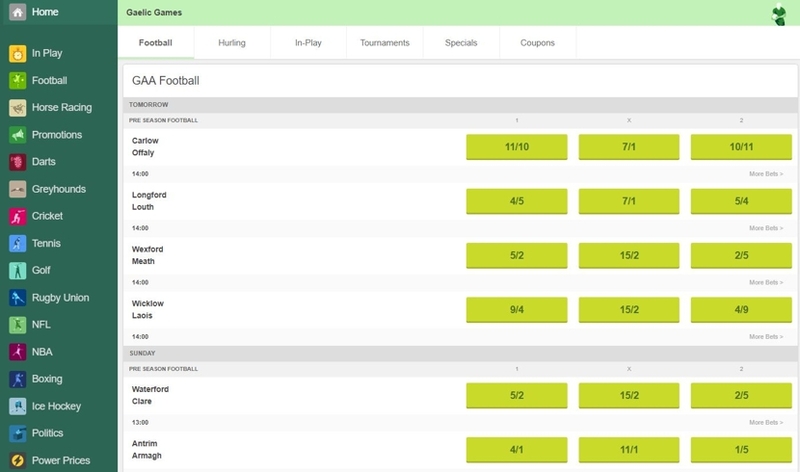 Saying that, the betting options, market depth, and live coverage are all pretty good, and odds update quickly and clearly, so if the extra bells and whistles don’t mean all that much to you or if you particularly like to live stream, then Paddy Power could be right on the money for what you need. Something that really irritated us was that once you have chosen an event you can’t get back to the in-play menu or see it in any way without starting all over again from the main tab. So once you select a football match, for example, and explore the odds and markets you are stuck there. On the plus side, the in-play interface allows you to categorise, collapse, and expand markets as you see fit which makes organisation and navigation once a breeze once you are there. 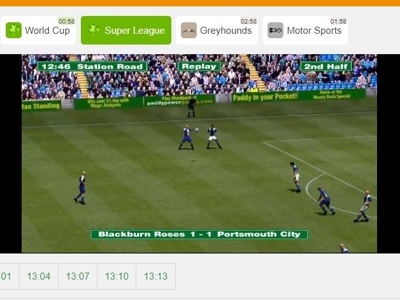 The live streaming service is head and shoulders above the in-play service in general, offering more streams than average throughout the day so there is always something to watch. Some fixtures are free to watch – you don’t even need money in your account – while others require a funded account but not an active wager. Horse Races require a £1 bet minimum but this is standard across the industry. The lack of any withdrawal or deposit maximums will be a welcome sight for many, but it’s always worth giving them a shout if you are dealing with larger sums of money just to make sure nothing goes wrong. Processing times are favourable although not world class, and all of the regular payment options are available. 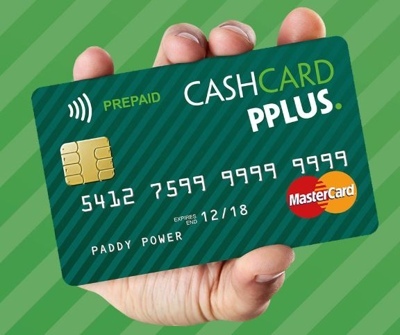 There is also the PPlus Card to consider with Paddy Power, but we will explore that in more detail later in the review. Paddy Power like coming up with new features and ideas. As well as the few we have listed below there is a VIPP rewards club (double P so you know it’s good), regular ‘money back if’ promotions that change like the weather, acca’s, a referral scheme, and a really great blog and news service. With the PPlus card, you can link your physical and virtual money so that online winnings can be withdrawn as cash in store. You can also bet instore with the money in your online account. It’s great because it gives the customer full control of their funds and cuts out withdrawal processing times. Pretty much all bookies with a physical presence do this now, but Paddy Power has developed the concept even further. The PPlus Card is actually a Mastercard, so you can also spend winnings in the same way you would spend money in your bank account. Just won £30? Get a round in for your mates, they’ll love you for it. You can also use it at ATM’s to withdraw cash from your online account. 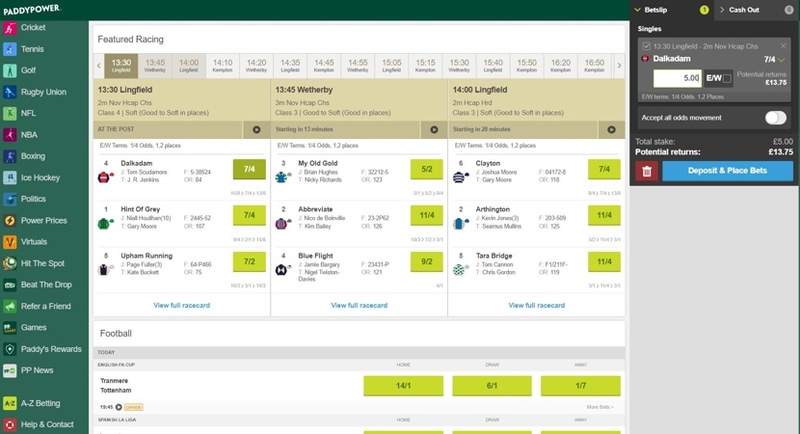 This is one of the larger Virtuals areas we have seen with seven different categories to bet on; flats, jumps, and sprints on the horses; world cup and super league football; greyhounds; and motor racing. It’s a mixed bag, with some lack luster commentary in some areas but some great visuals all round. They have framed the action bizarrely, however, and unless you go full-screen everything is a bit too small. New races/matches begin every 3 minutes and you can watch events that have already started if you want to, which isn’t an option everywhere you go. Paddy Power could improve this section, but there is more on offer than many other bookies can manage, and where else could you see Blackburn Roses take on the Ipswich Tractors? This is pretty unique. It’s a free to play penalty game with a cash prize jackpot. Every day, punters can play up to ten times and try to beat the days target score. Every punter that manages to do so will join the winner’s pool and at the end of the day that jackpot will be split between the winners. The jackpot is only £1000 so it’s not going to make you rich, but the game is genuinely fun to play with an element of skill involved, as you have to try and hit specific points and take wind speed and direction into account, as well as beating the keeper and an ever increasing number of defenders. 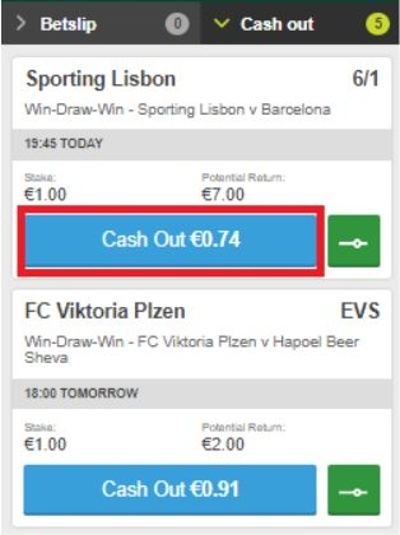 Paddy Power make it very clear which odds have cash out attached as an option, and the bet slip enables you to keep them separate from your other bets, too. The concept is simple. You can settle your bet early to either take a smaller but guaranteed profit, or to salvage some of your initial stake if things haven’t turned out as you planned. 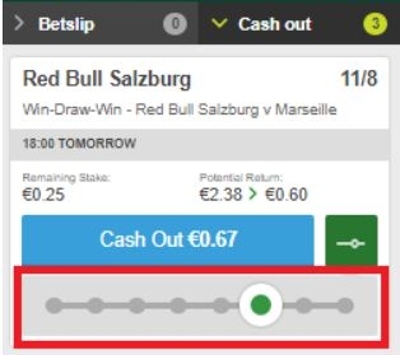 Odds change quickly as you can imagine as every event during a match has an effect on the outcome, so using cash out can not only be beneficial financially, but it can increase your heartbeat in those dying moments when your bet is about to come in but the other team looks like scoring. Just make sure you are quick if you want to use it, or the moment maybe lost. To cash out or not to cash out – that is the question. This is exactly the same idea as cashing out, except you can opt to leave some of your bet in at the original stakes. Suppose you have a £20 bet on England to beat Pakistan at the Oval. The scoreboard is looking good but the team are tired and you know that Joe Root was out on the beer last night. You could leave £10 in at your original odds and chance it, but cash out £10 and make a guaranteed profit on half of your stake. This gives the punter a lot more power and choice not to mention more value for money where entertainment is concerned. As well as a huge sportsbook, Paddy Power runs a full scale casino operation with bingo and poker products alongside. The casino also contains a live casino, both of which are powered by the industry giant that is Playtech, which means quality slots and jackpots are guaranteed. Other providers can be found in the games and Vegas sections of the site. Instant win and scratch games are on hand if you want minimum effort entertainment, and if none of that takes your fancy then maybe the table and card games will; roulette, blackjack, and video poker are all available in good numbers. This isn’t our favourite website in the world, but there is a lot to praise here nonetheless. Obviously green is the dominant colour, and while the site is capable of an awful lot it isn’t very stylish and the personality of the brand doesn’t really come through either. 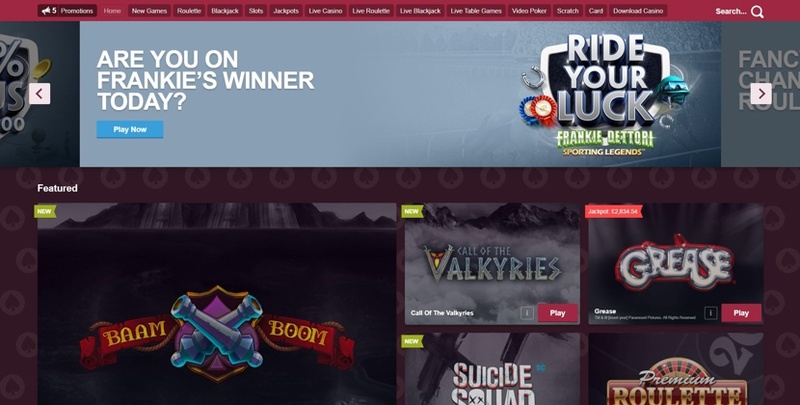 It runs on the OpenBet platform which processes more bets each year than anyone else hands down and has won more awards than any other provider too. Going back to our naughty school kid analogy, we can’t help feeling that if Paddy Power had spent more time working on their site and less time messing around on Twitter, they could have taken full advantage of what OpenBet can do. There are a lot of different elements to the site that need to be brought together to create a more fluid experience, it feels a bit disorderly at the moment with too many page loads and new windows to work through. Depositing works better as it displays in front of the screen you are on without interrupting flow – more of this is needed. There are too many Quick Links for them to be truly useful but once you open up a sports category things improve dramatically. The interface isn’t particularly pretty but it is structured brilliantly. 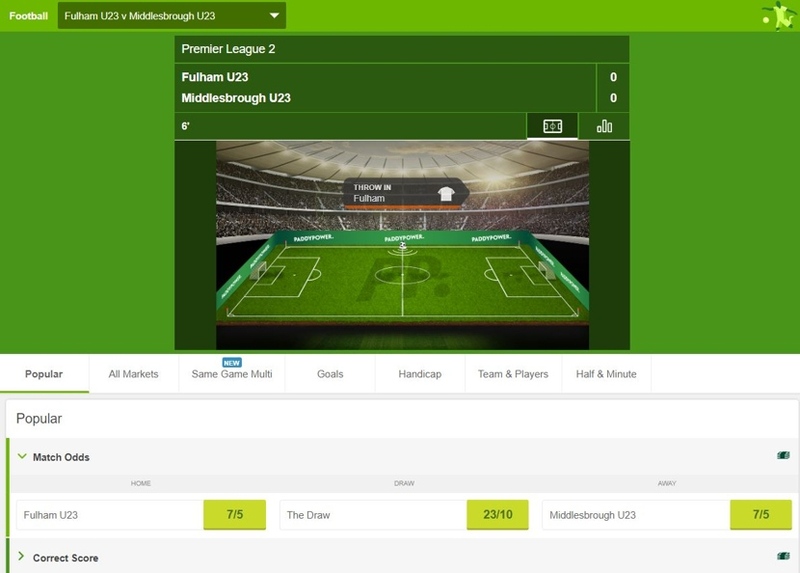 All options relating to the sport in question – such as in-play, tournaments, specials, coupons etc – are displayed and you can snap between them instantly which makes managing your activity very easy indeed. Handy icons indicate when cash out, live streams, offers, and early payouts are available, but there is a heck of a lot of scrolling to do. Organisation options need improvement. The bet slip is easy to manage too, with cash out bets displayed separately for added simplicity and to save time if you have a lot on there; but the casino games listed underneath are way too prominent for our liking. This is supposed to be a sportsbook, after all. 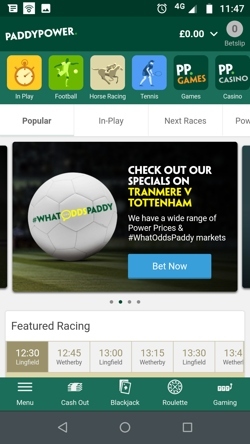 Both the Paddy Power app and mobile site are structured in more or less the same way as the desktop site, with a few operational tweaks to better suit the smaller screen. It’s another decent offering without doing anything to blow you away, and while there is certainly room for improvement it will serve you perfectly well as a companion to the desktop site, or even as a standalone product if you prefer to bet on your phone. A scroll bar points you in the direction of popular options and other Paddy Power products like the casino, and there is instant access to cash out which is always welcome on mobile as if you need it you will need it quickly. There is still an awful lot of scrolling to do, however, and little thought seems to have gone into how to solve this. Horse Racing works a lot better from a structural point of view, you can easily scroll horizontally through all of the day’s meetings from one place and then switch between race tracks from each race card etc. Elsewhere, once you have picked an event the site works much more efficiently, utilising drop-down collapsible subcategories to organise markets – but why oh why can’t the same be true when you are scrolling through the fixtures? All of the nice little extra features have made it across to the small screen too, so you are getting more or less the same experience, and the whole thing performs well. The common theme with Paddy Power seems to be that while the content is great, the way it is presented should be tightened up. Paddy Power was founded in Dublin in 1988 by David Power, John Corcoran, and Stewart Kenny, three Irish bookmakers who joined forces, consolidating their combined 40 shops under one banner. Given the political situation at that time, it was a bold move to name the company as they did, although there is a little more to it than that. David Powers teenage son was called Paddy, making him Master Paddy Power himself. He now works as the company’s marketing spokesman. Expansion was aggressive, favouring high street hot spots as shop locations rather than the side streets that were the norm in those days. This, combined with their bright green branding and novelty bet range, saw them gain media attention and quickly rise to prominence. By 2000 the company was listed on the London Stock Exchange to help fund expansion into the United Kingdom, and in 2001 they could claim 33% of the off course betting market share in Ireland. In the five years between 2005 and 2010, Paddy Power went from operating 195 to 356 high street betting shops, with around 40% of their estate now in the UK. The company has always had something of a rivalry with Betfair, so it was a surprise when the two bookies announced plans of a merger. This was completed in February of 2016 as an acquisition by Paddy Power, and their name was changed to the imaginative Paddy Power Betfair. Never one to be afraid of a little controversy, Paddy Power’s sense of humour is close to the knuckle and attracts a fair amount of criticism from some whilst simultaneously endearing themselves to others. They racked up the most complaints to the ASA in history when they offered odds on the outcome of the murder trial concerning double amputee and Paralympian Oscar Pistorius with the slogan: Oscar Time – Money Back if he Walks. Other controversial moves include odds on recently deceased Ugo Ehiogu becoming the new manager of Birmingham City FC; releasing a YouTube video of chavs being shot with tranquilizers before Cheltenham; and an advert showing sight-impaired footballers kicking a cat. We know you are laughing at these by the way. Shame on you. Less funny was when they refused to pay out on 3000/1 odds that miraculously came in, instead coming to an arrangement with those involved. None of this ever seems to do them any harm, however, as Paddy Power is now Irelands largest and most successful bookmaker with over 600 physical locations, a string of popular and well developed online products, and its own office building in Dublin which they have dubbed the Power Tower. Why Bet With Paddy Power? There isn’t a bookie out there with a bigger personality, so the entertainment factor with Paddy Power is huge – as long as you enjoy their sense of humour of course. If you are easily offended you may well be put off. Those who enjoy the lighter side of betting will find fun in exploring their novelty bets, and it may sound daft to say it but Irish bettors or those who follow Gaelic sports will get full market coverage here. The fact that Paddy Power is a bricks and mortar bookie will also appeal to many punters as there is a human point of contact, and they are especially good for regular offers and numerous extra’s. 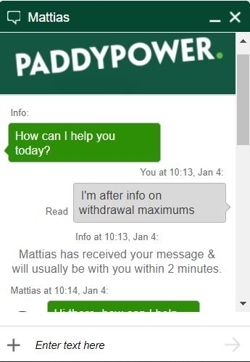 Paddy Power isn’t one of those bookies who try to hide from their customers, in fact, they try to encourage direct contact to solve issues immediately. For this reason they have stopped offering email support and instead prompt punters to call them or use live chat, both of which are available 24/7. There is some contradiction with these hours on the website but the support agent we spoke to ensures us they are open all day and night. Since they frequently reach out to their customers via marketing over social media, this is another way in which Paddy Power invite engagement. The searchable Help/FAQ section contains a lot of useful info so you can self help most of the time, and while this section isn’t particularly inspiring to look at it does the job as intended and is easy to use. It just feels a little like you are in the basement of the site and it doesn’t get much attention. Live Chat – You can get to live chat via the contact button in the help centre, but you need to select one of the options first. Email – Email service no longer available. Phone – 0800 056 5275 is the number to call. It’s free all day and night. @AskPaddyPower – This account is hilarious, witty, savage, engaging, useful – we could go on. Follow it.